Cappadocia, an area in Turkey where entire cities have been carved into rock, is pretty incredible on its own. But whenever hot-air balloons pepper the sky, its beauty level simply skyrockets. 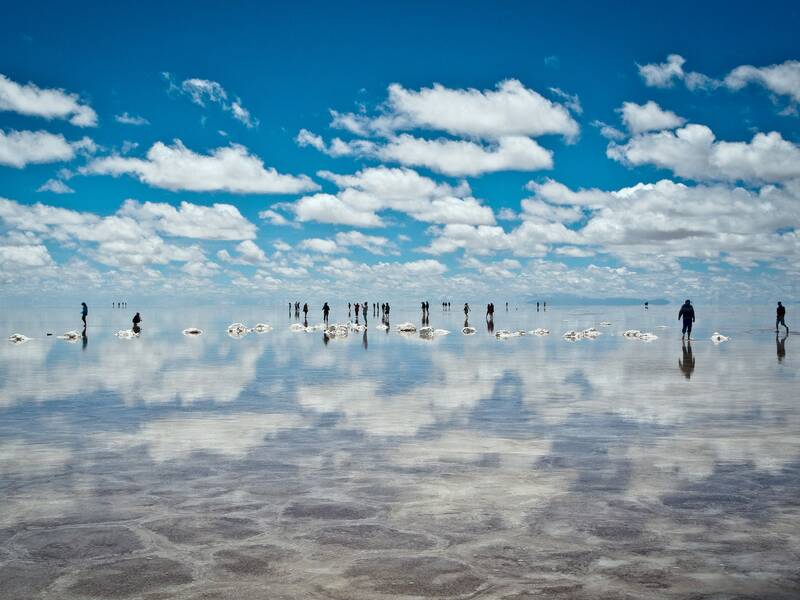 The reflective surface of the world's largest salt mine is like something from the imagination of Salvador Dali—although we're happy it actually exists in real life. 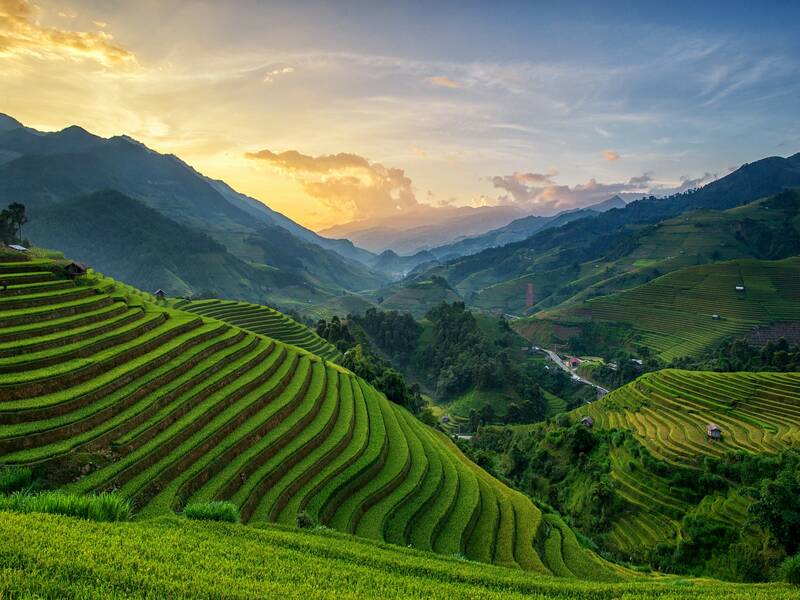 Mù Cang Chải manages to be one of the most breathtaking spots in Vietnam, with terraced rice fields and mountainous landscapes. 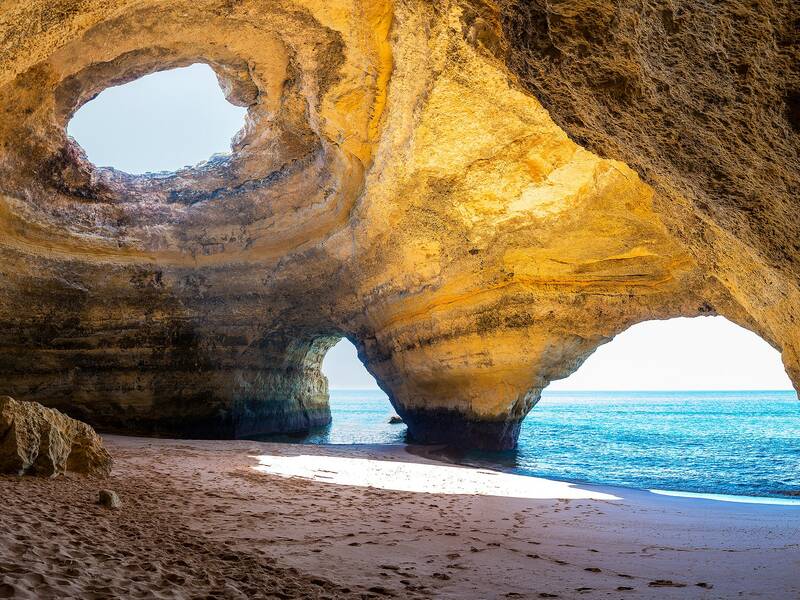 The southern coast of Portugal is lined with exquisite beaches and caves, including the famous Benagil Sea Cave (skylight included). 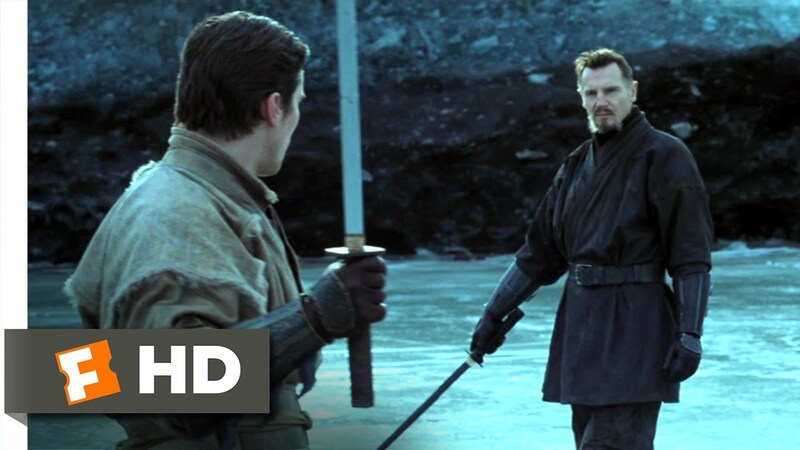 Iceland's Snæfellsjökull glacier, complete with ice caves and craters, has appeared in Jules Verne'sJourney to the Center of the Earth and the film Batman Begins. 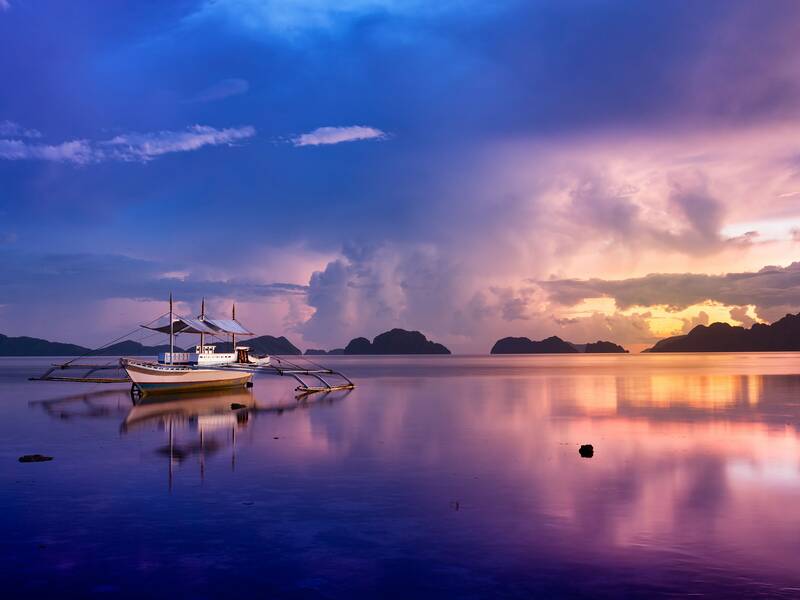 With its limestone cliffs and pristine lagoons, it's easy to see why Palawan was voted the best island in the world by our readers. 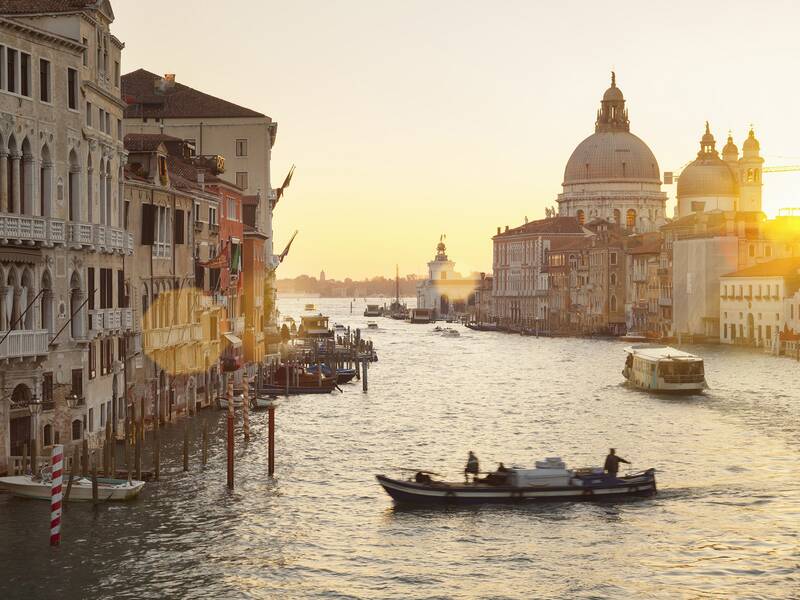 Of all the amazing cities in Italy, there is something truly enchanting about the sunlit canals ofVenice. 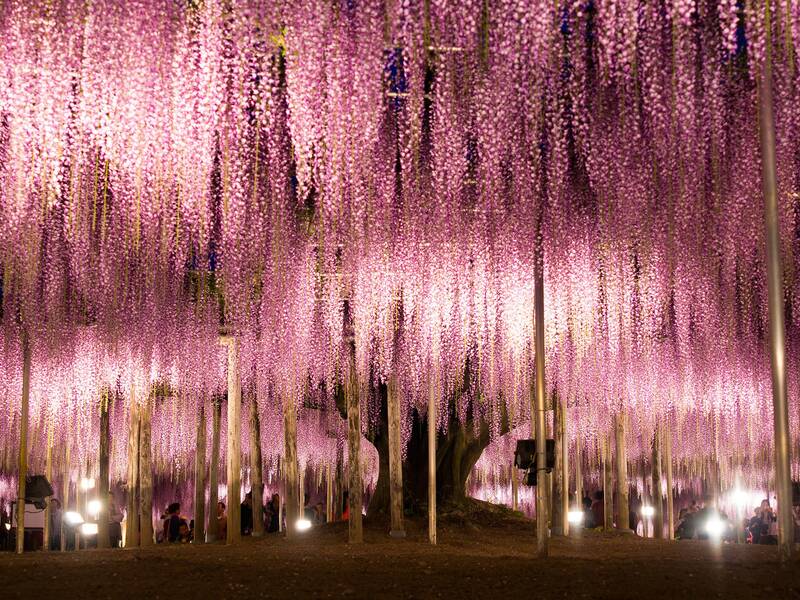 Ashikaga's wisteria trees bloom brilliantly for a few weeks every spring, turning the park into a vision of pastel pinks and purples. 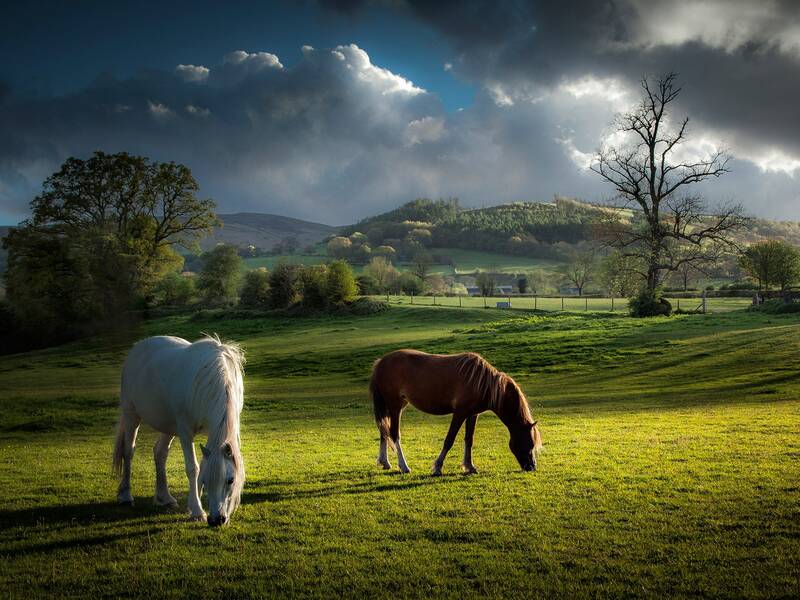 Brecon Beacons offers access to rolling hills, Medieval castles, and romantic waterfalls. Plus it's arguably the best place to stargaze in the UK. 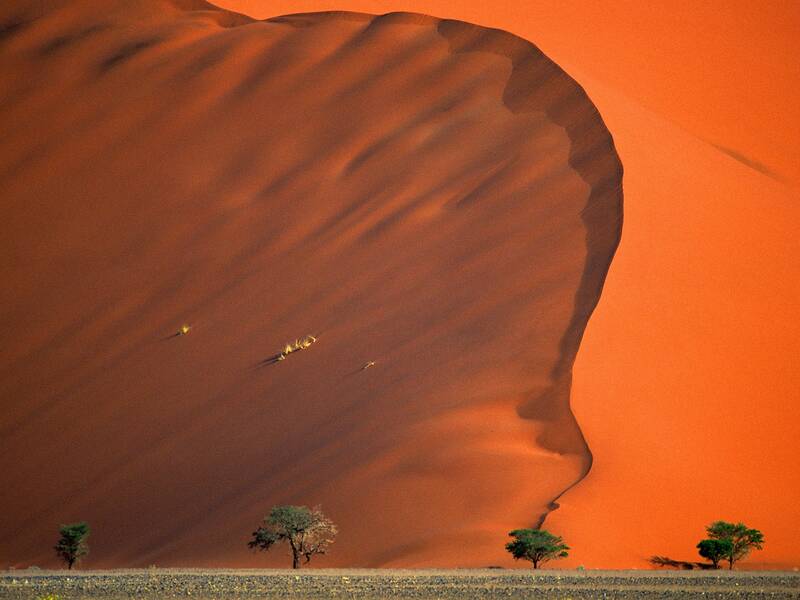 Red sand dunes and skeletal trees make Namibia the closest thing we have to Mars on Earth. The Namib Desert was also the filming location for Mad Max: Fury Road. 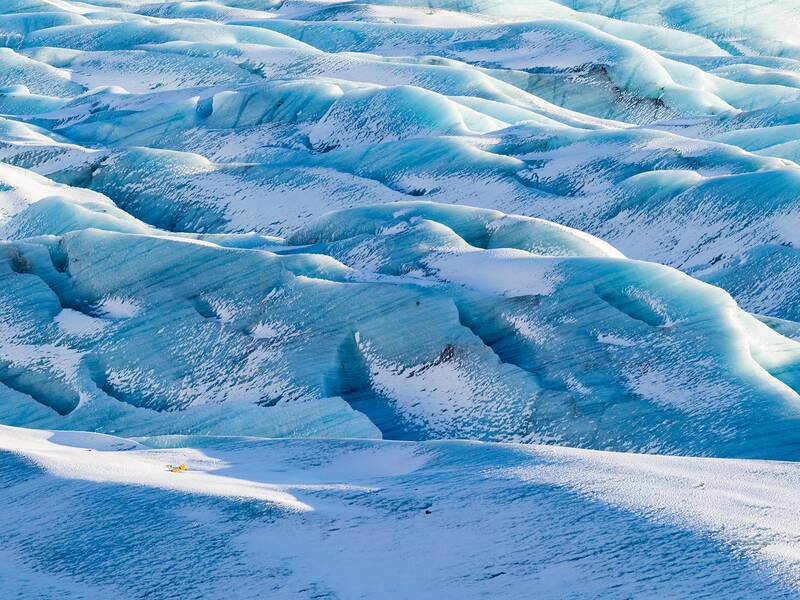 New Zealand is no stranger to breathtaking landscapes. 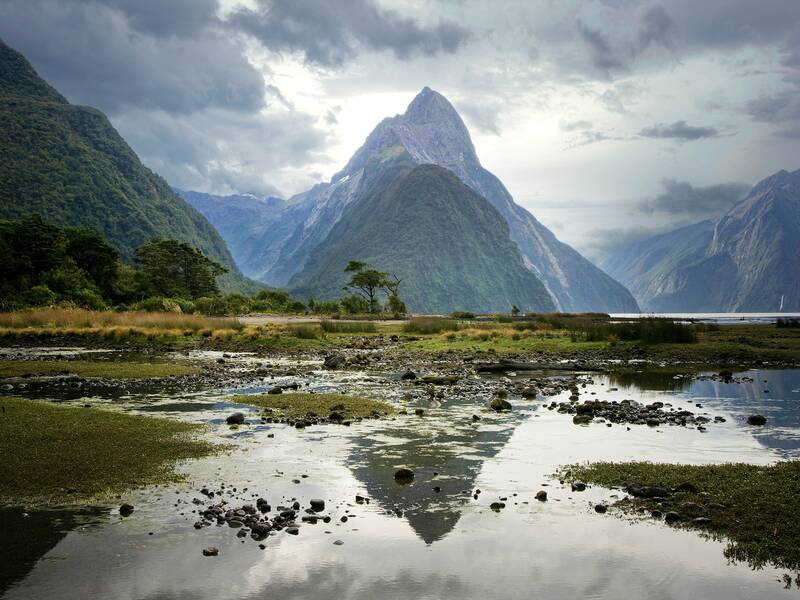 Case in point: Milford Sound, a mountainous fjord where you can live out all of your Lord of the Rings fantasies. 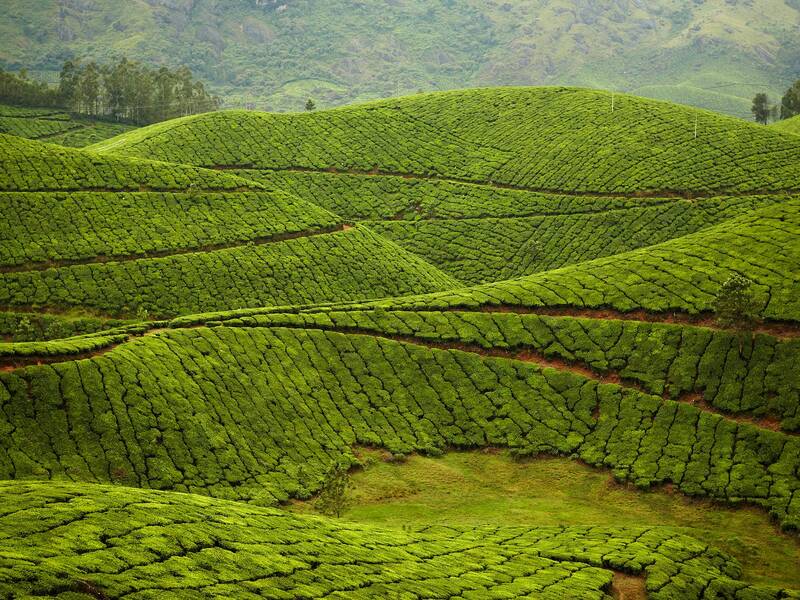 Situated more than 8,000 feet above sea level, Kolukkumalai is the highest tea estate in the world—and easily the most beautiful. 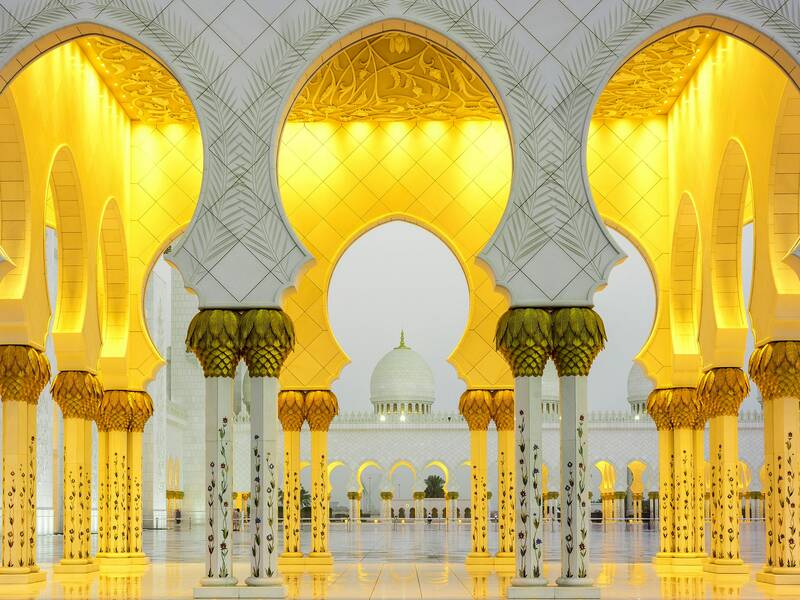 Although the Sheikh Zayed Grand Mosque has only been around for less than a decade, its regal architecture has already made it the crown jewel of Abu Dhabi—and one of the largest mosques in the world. 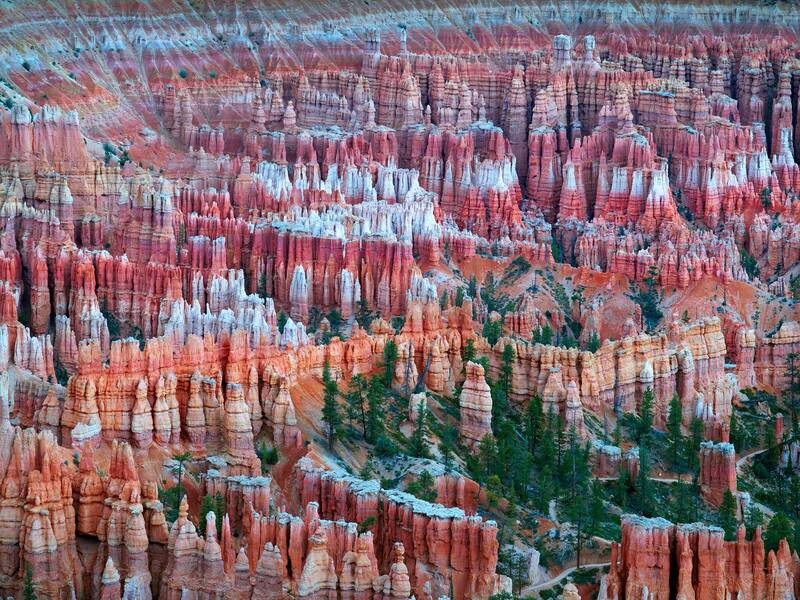 Bryce Canyon's layered red and orange rock pillars, known as hoodoos, make it a can't-miss destination for campers and shutterbugs alike. 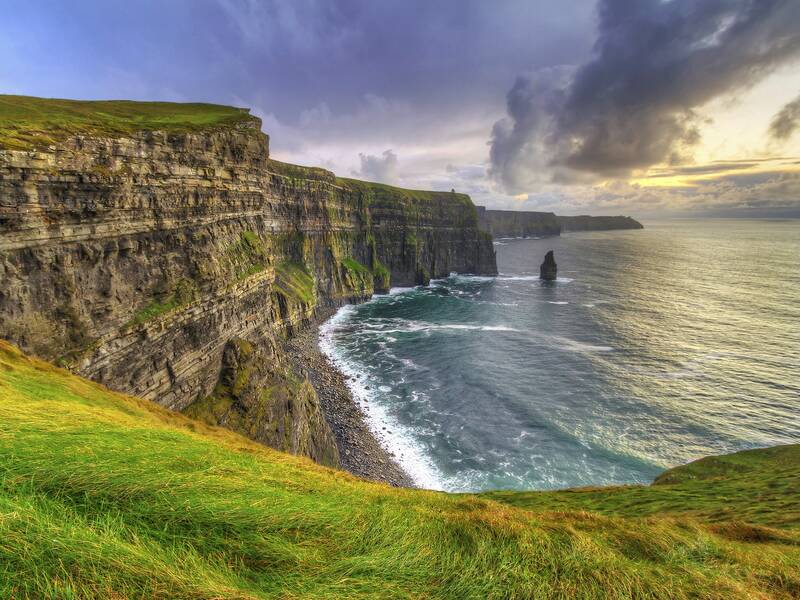 You might know them better as the Cliffs of Insanity from The Princess Bride, but this seaside wonder is actually located just south of Galway. Inconceivable! 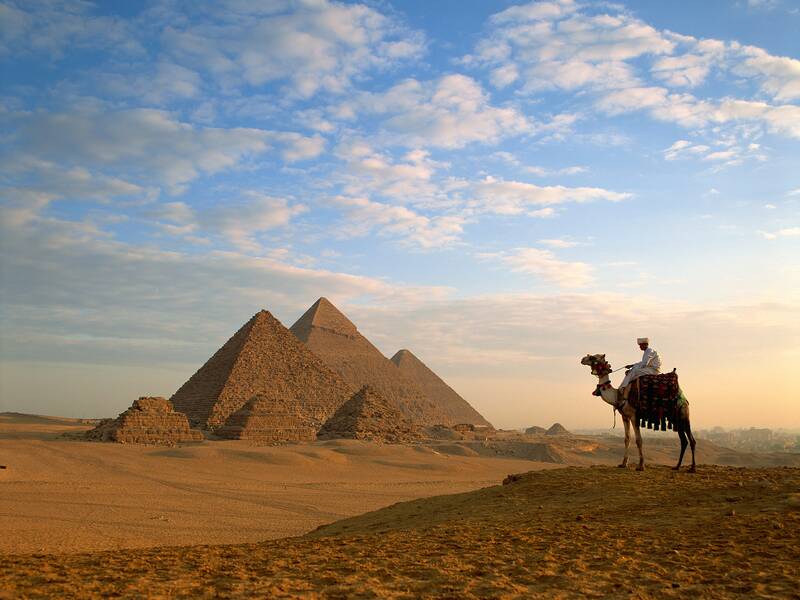 Giza's three great pyramids are mysterious marvels of architecture. We may never know whether or not they were built by mutants. 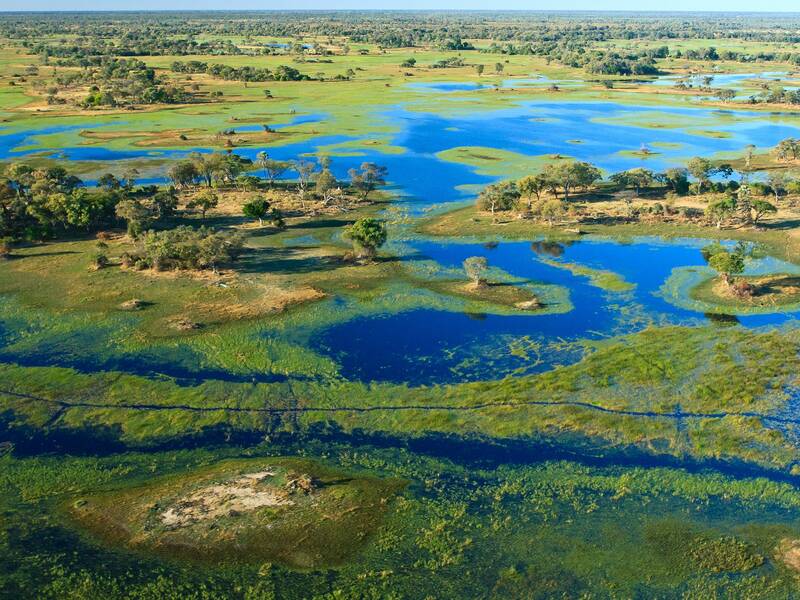 The lush Okavango Delta is like a real-world Eden, where cheetahs, zebras, buffalo, and rhinos roam freely. 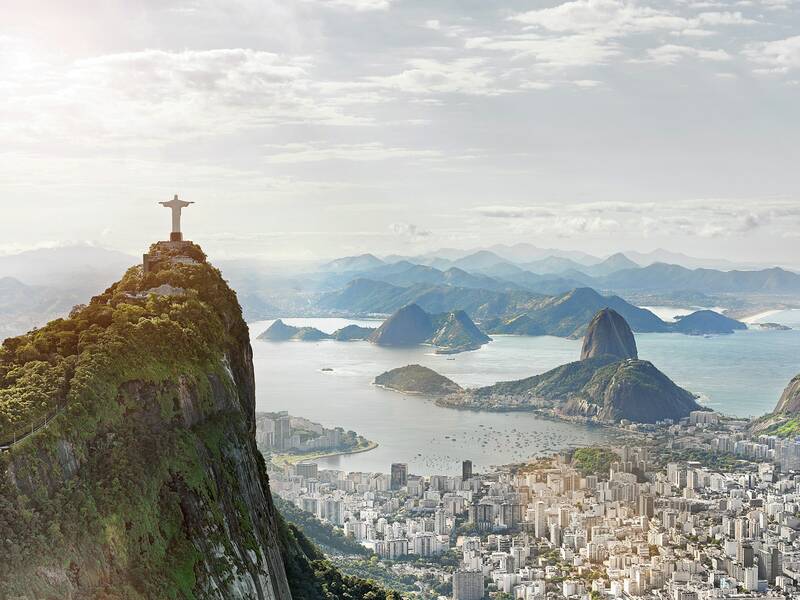 A striking natural setting makes Rio de Janeiro one of the most beautiful cities in the world, all overlooked by the equally stunning Christ the Redeemer statue. 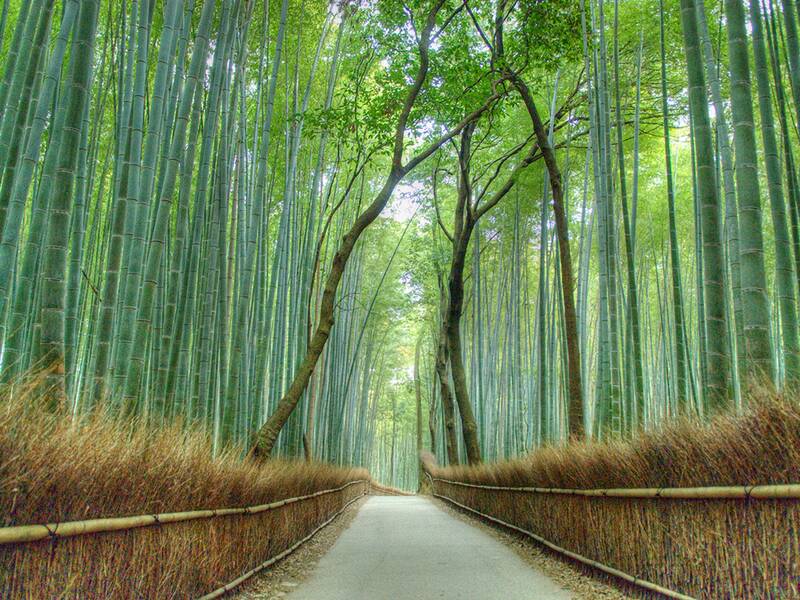 The serene beauty of the bamboo forest in the Arashiyama district is a wonderful site to behold. No wonder it's one of Pinterest's most beloved places. 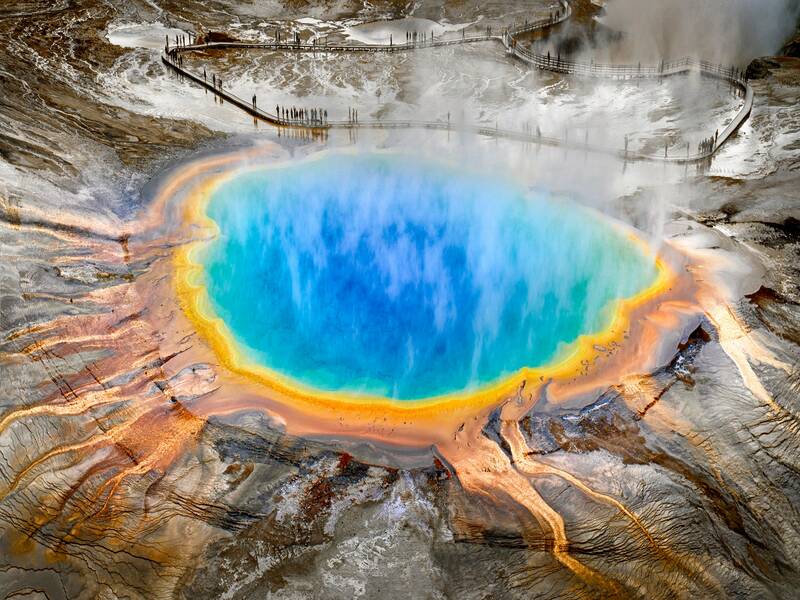 As its name suggests, the largest hot spring in the United States is essentially a rainbow ring of vibrant colors. 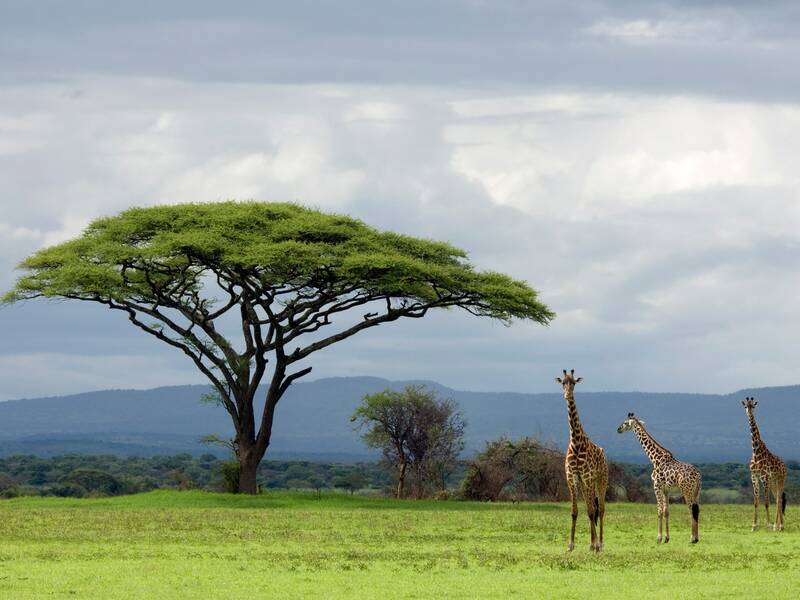 Tanzania's portion of the Serengeti is the ideal location for an African adventure. 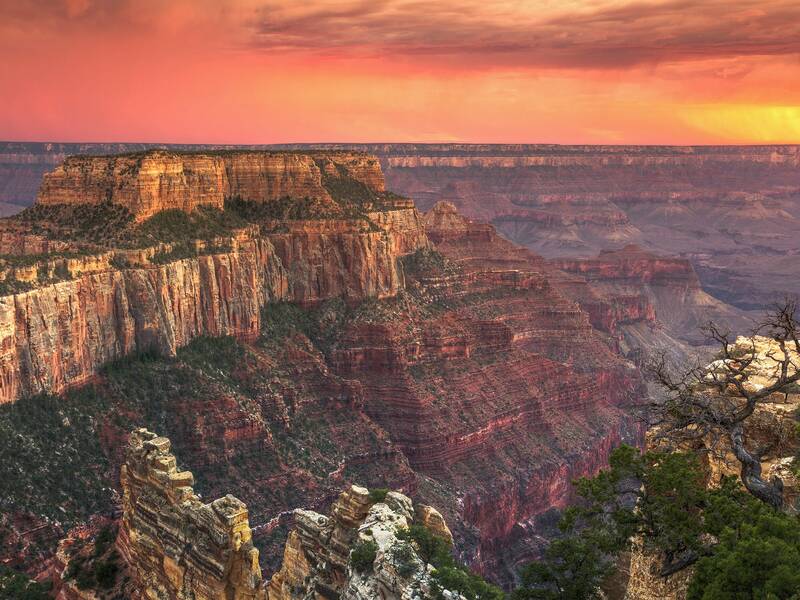 There's a reason why more than 5 million people visit the Grand Canyon every year: It's one of the seven natural wonders of the world, but a lot easier to access than Mount Everest or the Great Barrier Reef. 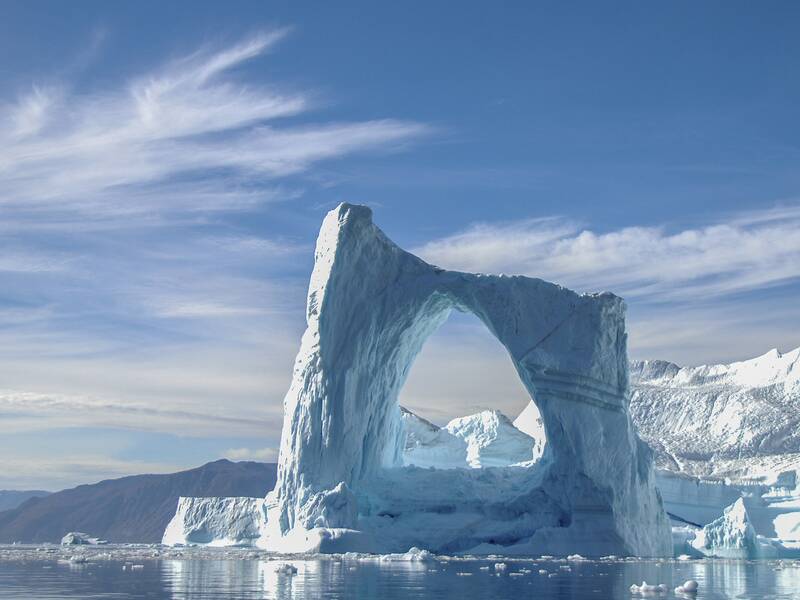 Whether you're spotting the Northern Lights in Sweden or glaciers off the coast of Greenland, the Arctic Circle is a new kind of hidden paradise. 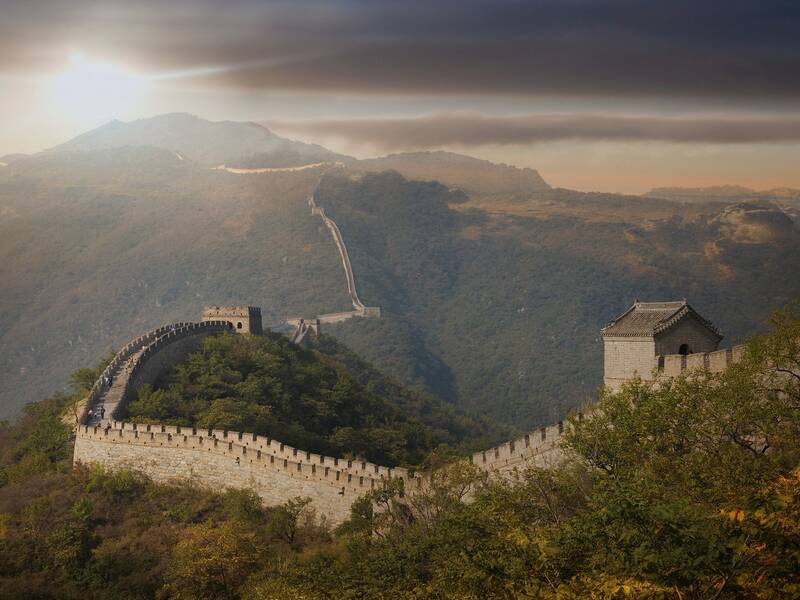 It's over 12,000 miles long, thousands of years old, and can be seen from space—no wonder theGreat Wall nabbed a spot on this list. 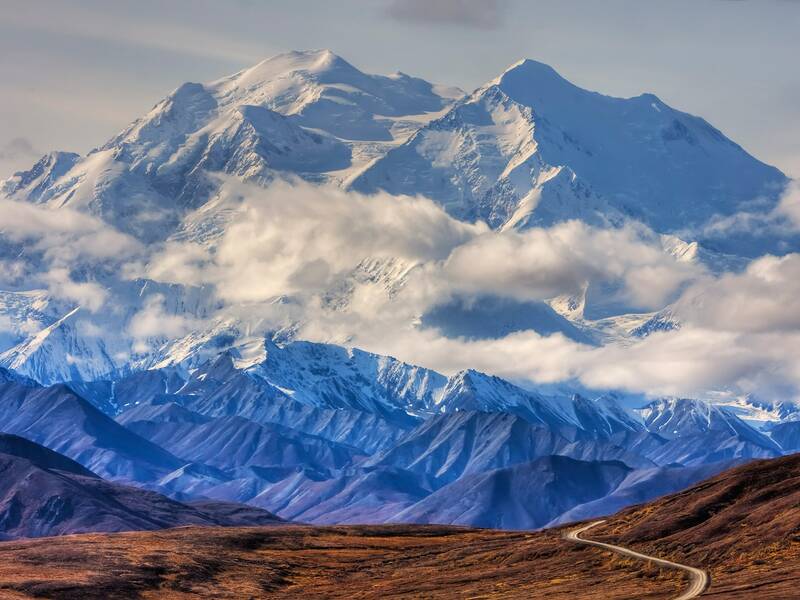 Despite controversies over name changes and a shrinking elevation, Denali's beauty is worth braving the extreme low temperatures. 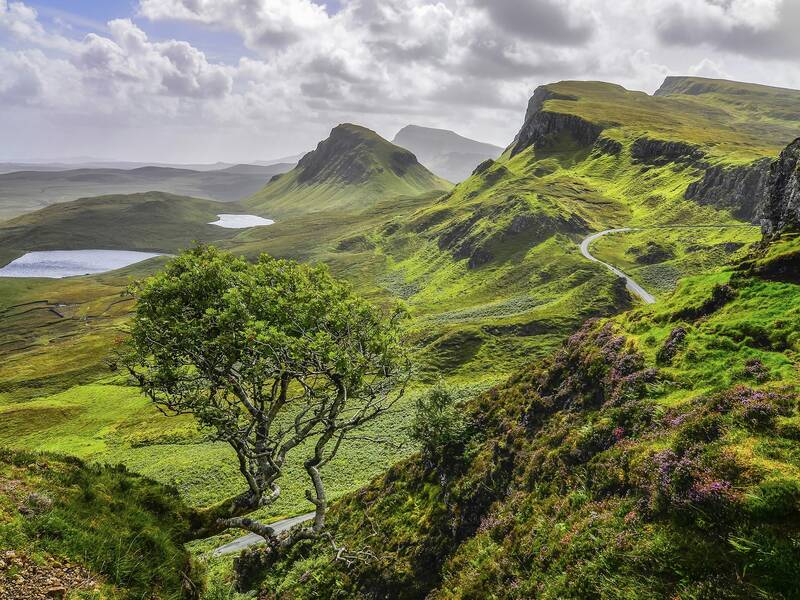 With fairy pools and bright green hills, the magical Isle of Skye is the stuff dreams are made of (regardless of whether you've binge-watched Outlander yet). 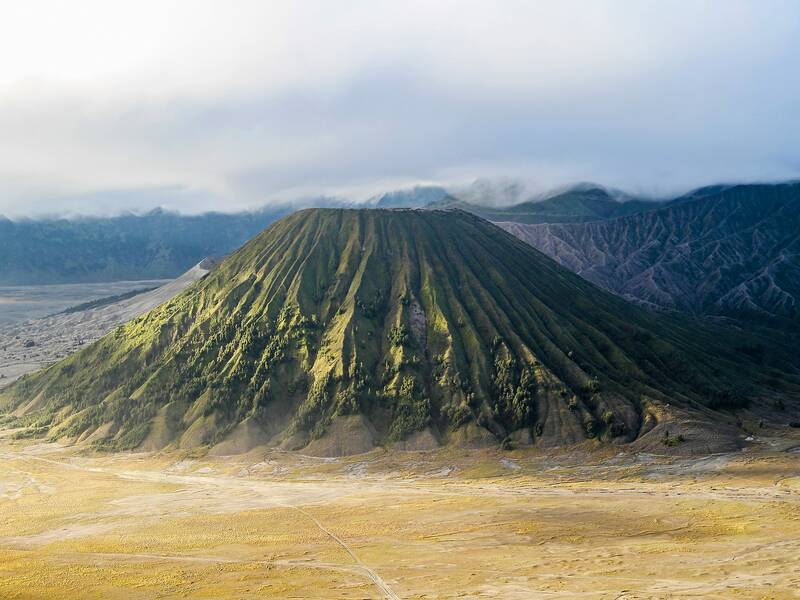 Mount Bromo is perhaps the most well-known volcano in East Java's Bromo Tengger Semeru National Park, thanks to its accessibility and epic sunrise views. 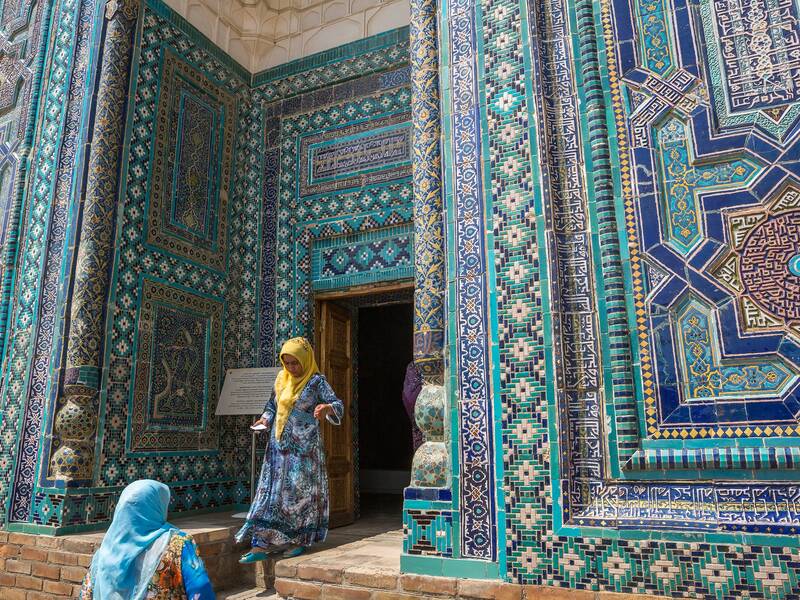 While it may not be the first place you'd pick for a vacation abroad, Samarkand is a standout with intricately tiled buildings and colorfully dressed locals. It also has a rich history as a Silk Road stopping point. 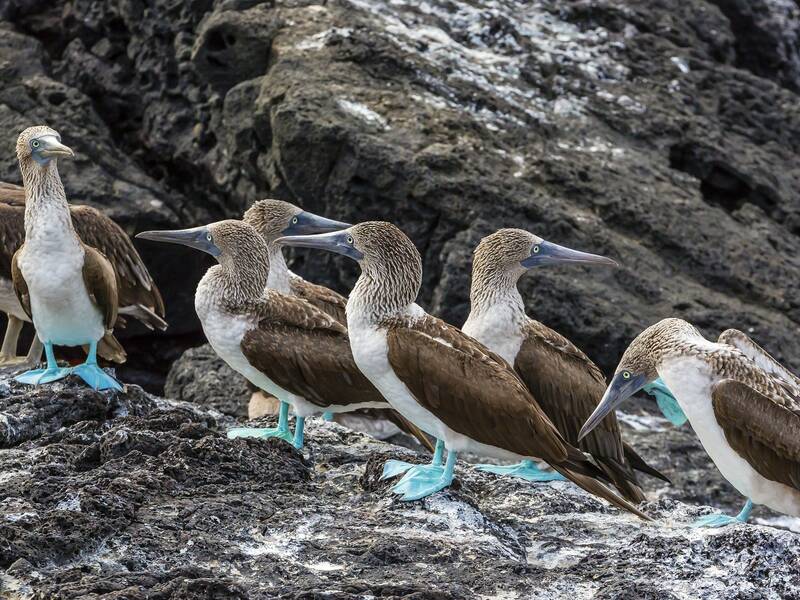 This volcanic archipelago off the coast of Ecuador is world-renowned for its idyllic snorkeling spots and diverse array of wildlife (including the always delightful blue-footed boobies, pictured). 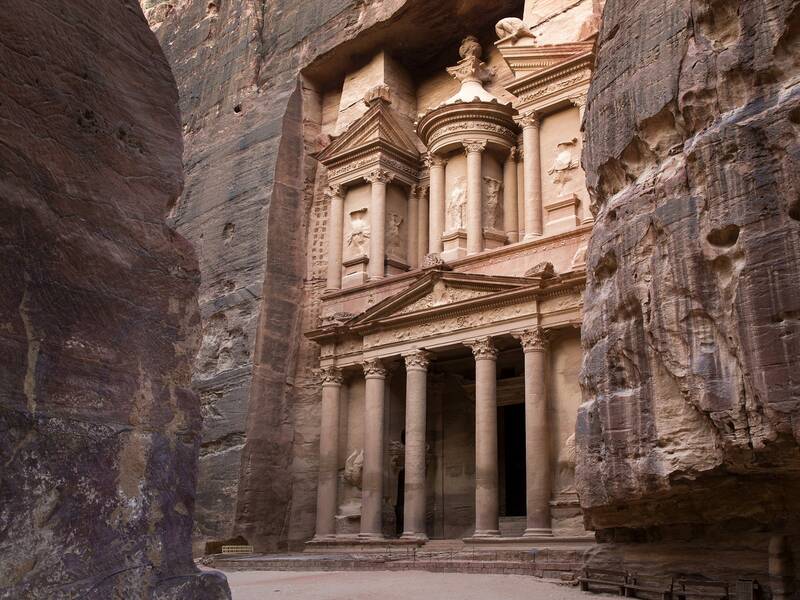 The ancient city of Petra may be renowned for the buildings carved directly into the sides of cliffs, but its real claim to fame is being the (fictional) home of the Holy Grail. 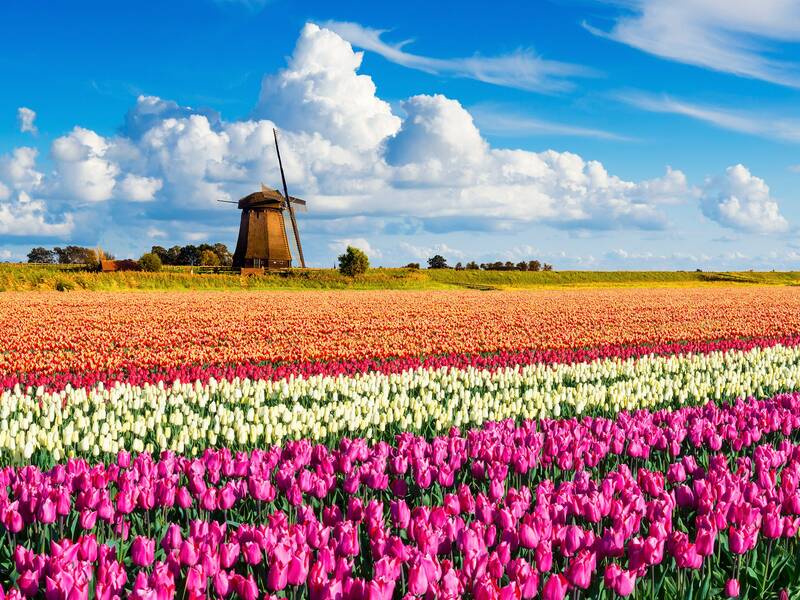 Holland is known around the world for its rainbow-hued fields of tulips, especially those located in and around Keukenhof. Millions of bulbs are planted in the park each year—visit in mid-April to see the flowers during their peak season. 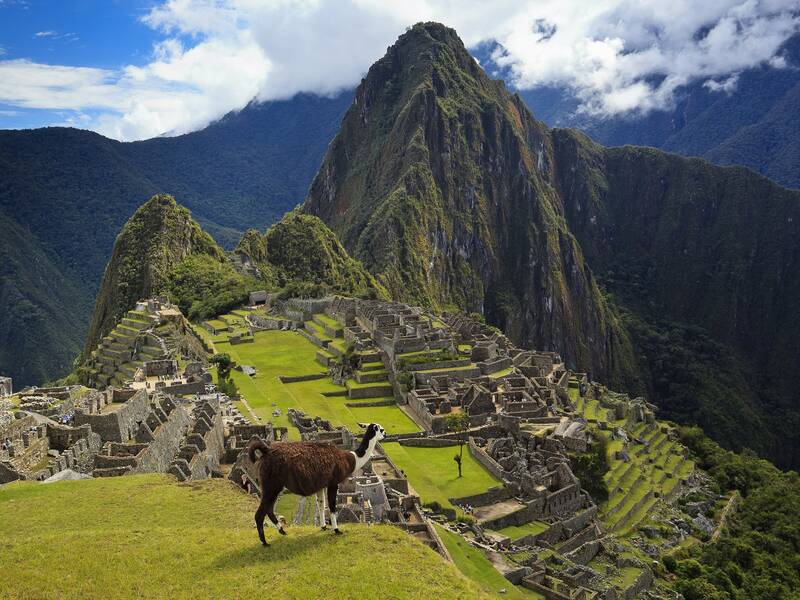 Machu Picchu's panoramic views and intricate (and a tad mysterious) stone walls more than validate the site's worldwide fame. 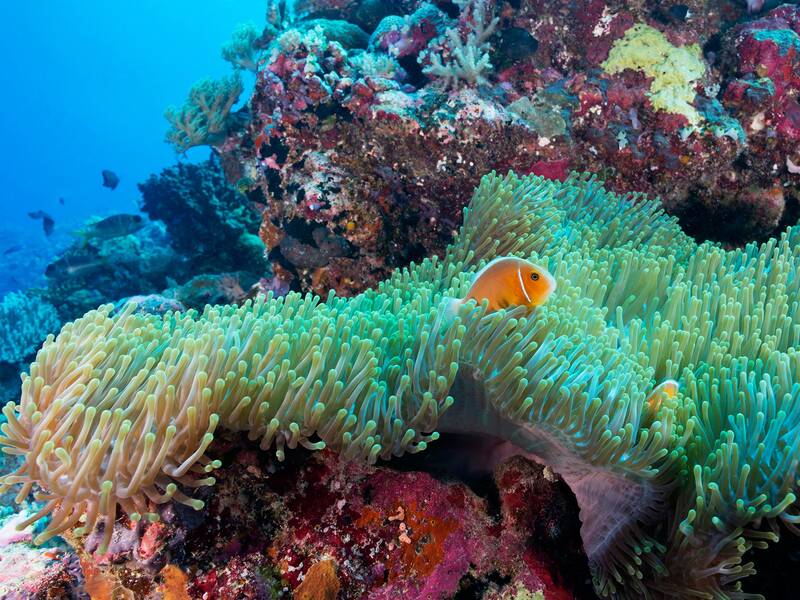 Although the largest living thing on Earth can be seen from space, the best vantage point belongs to the avid snorkelers and scuba divers who visit each year. 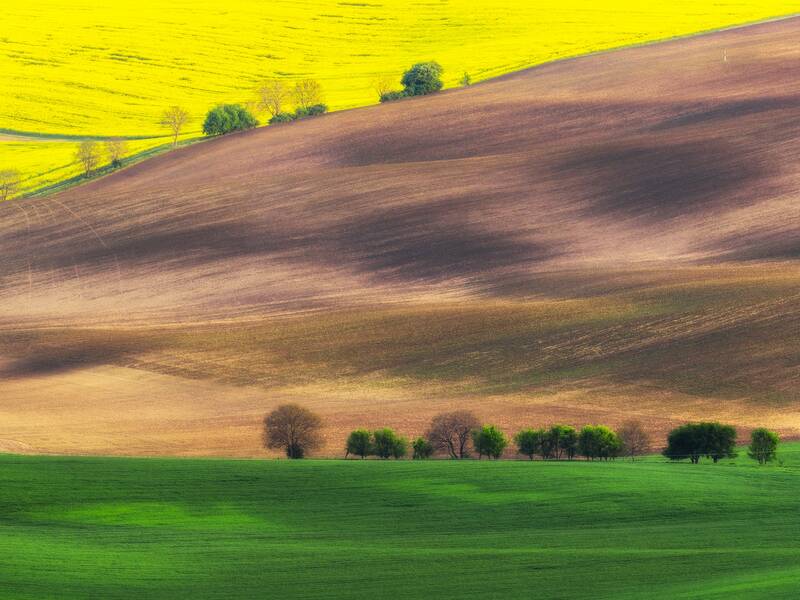 It's more believable to think the Moravian Fields are the product of an oil painter's genius brushstrokes, but these pastel-colored hills are very much a reality. Socotra kind of looks like it was transported to Earth from a distant planet. 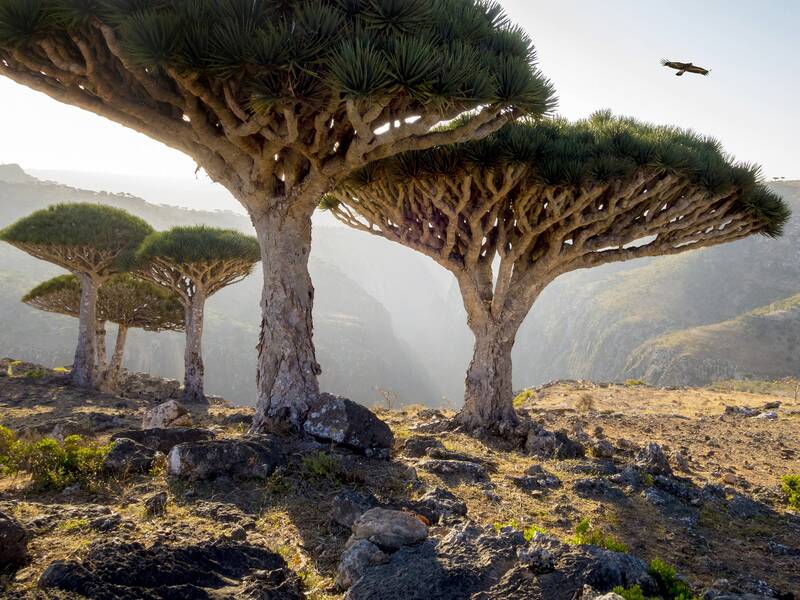 The UFO-like dragon's blood trees are the island's most notable feature. 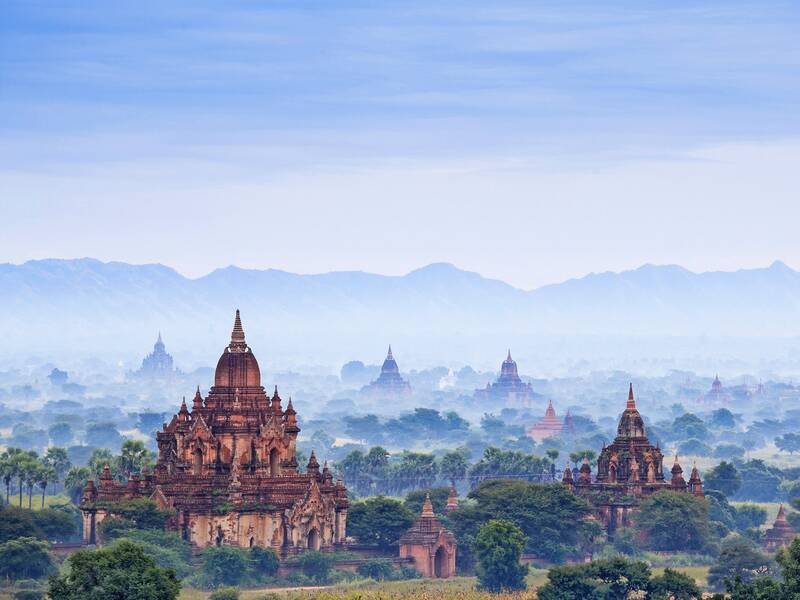 Bagan's ancient city skyline is like nothing else in the world, with ochre stupas and temples rising above the surrounding forests. 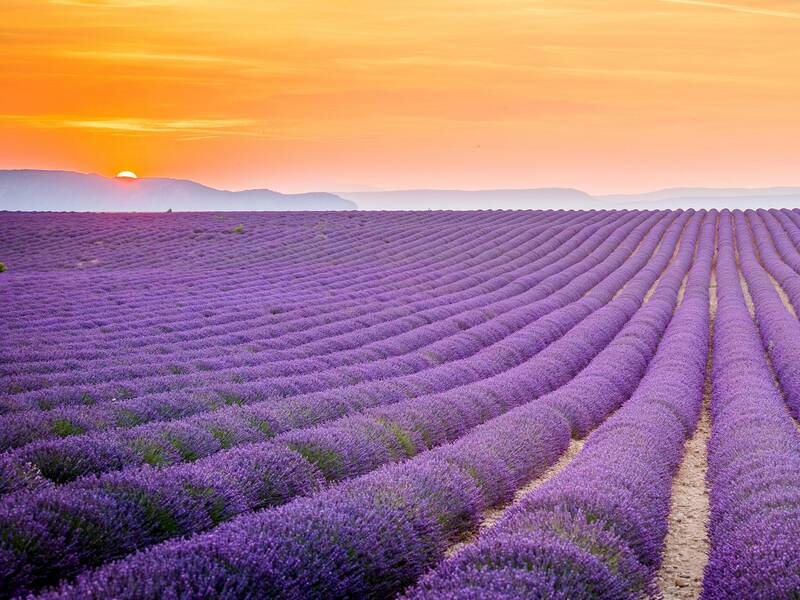 The seemingly endless stretches of lavender fields make Provence one of the prettiest (and best-smelling) places in France. 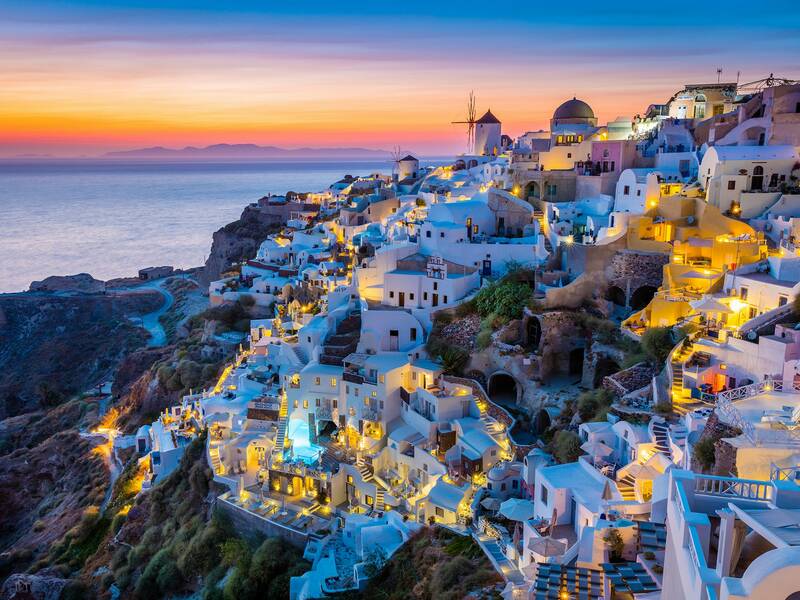 Santorini is officially one of the best islands in the world—and one of the most picturesque. The small village of Oia is particularly captivating, with its whitewashed buildings and bright blue roofs. 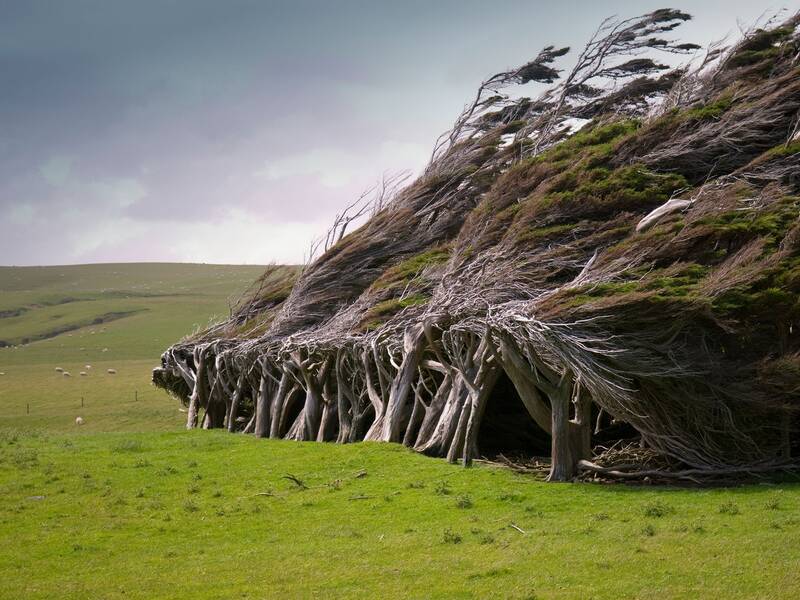 The next time you want to complain about the wind messing up your hair, just consider the trees of Slope Point, which have been permanently twisted and windblown by intense Antarctic gusts. 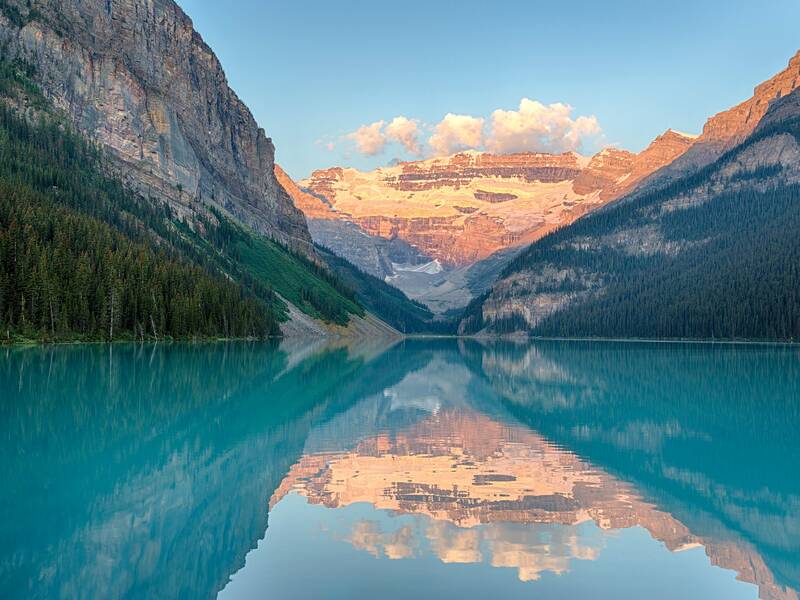 As is the case with most glacial lakes, Lake Louise is surrounded by rugged mountains and filled with clear, vibrant water. 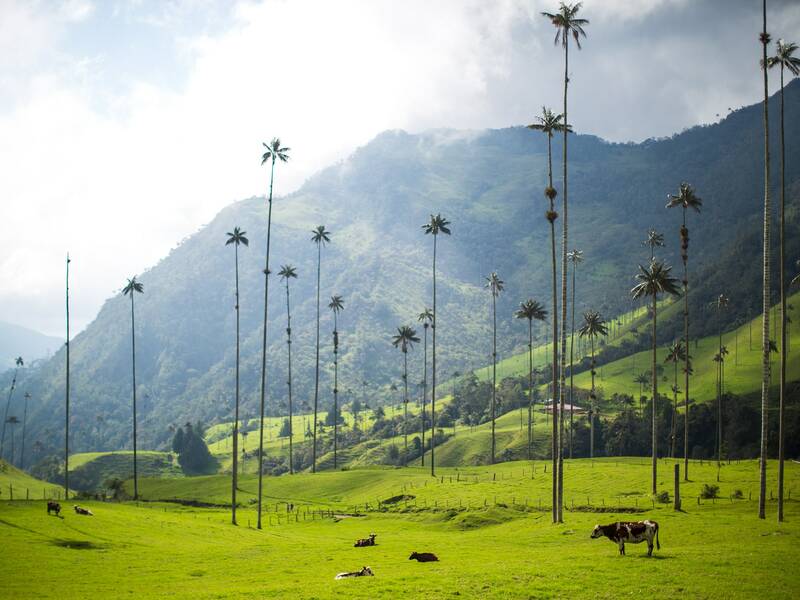 In case you were wondering where to find the world's tallest palm trees (palma de cera), you needn't look further. 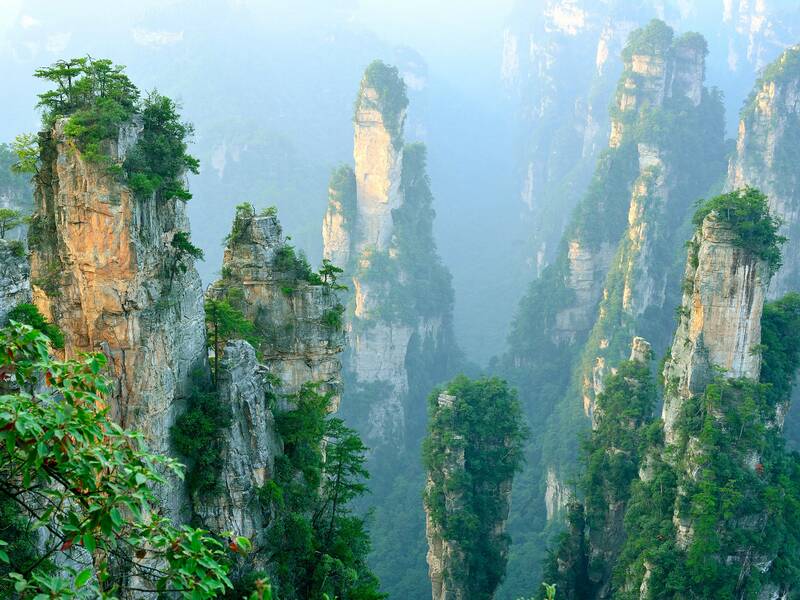 The lithe trees are even more incredible set against the backdrop of misty green hills and sharp mountains. 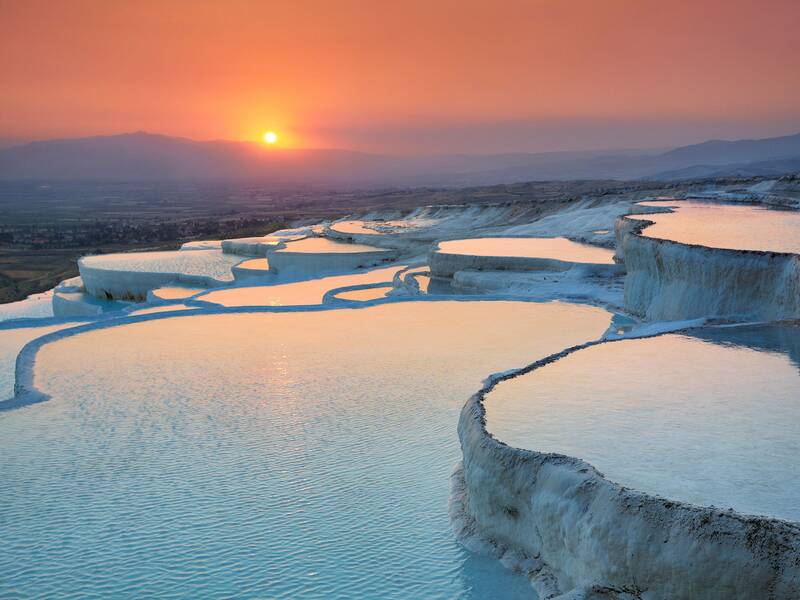 The stacked pools in Pamukkale are usually surrounded by snow and frozen waterfalls, but the blue waters are hot and open to bathers. You'll never be satisfied with your hotel's infinity pool again. 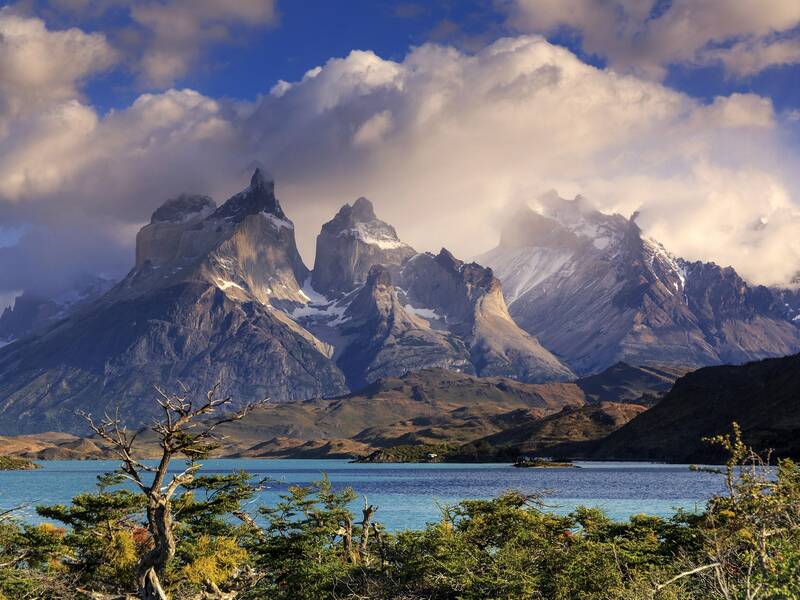 Torres del Paine is like a microcosm of all the things that make Patagonia such a spectacular place: sky-high mountains, blue icebergs, and mythical lakes. Scenic might be an understatement in this case. This 100-square-mile attraction contains thousands of sandstone pillars that are nature's version of skyscrapers—some even stretch taller than the Empire State Building's midpoint. 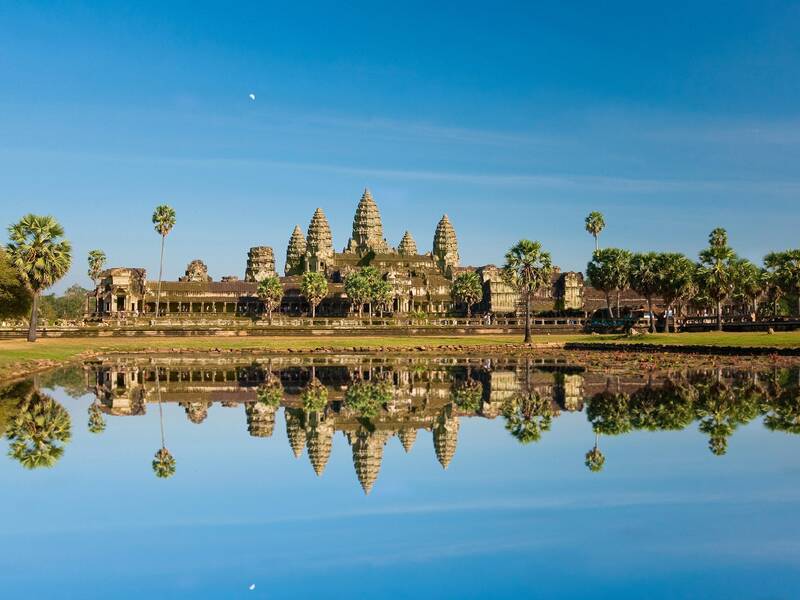 Some popular tourist attractions are worth braving the potential crowds for, and Angkor Wat is at the top of that list. No matter how many Asian temples you've seen, this one will always be the grandest and most breathtaking. 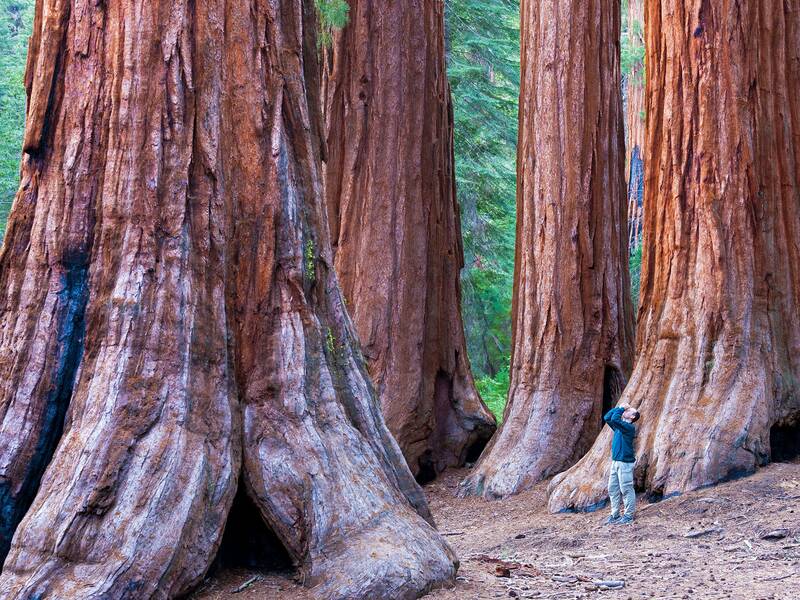 Standing in the middle of California's Redwood National Park is a humbling experience to be sure, especially when you look straight up at the 2,000-year-old, 300-feet-tall natural giants. 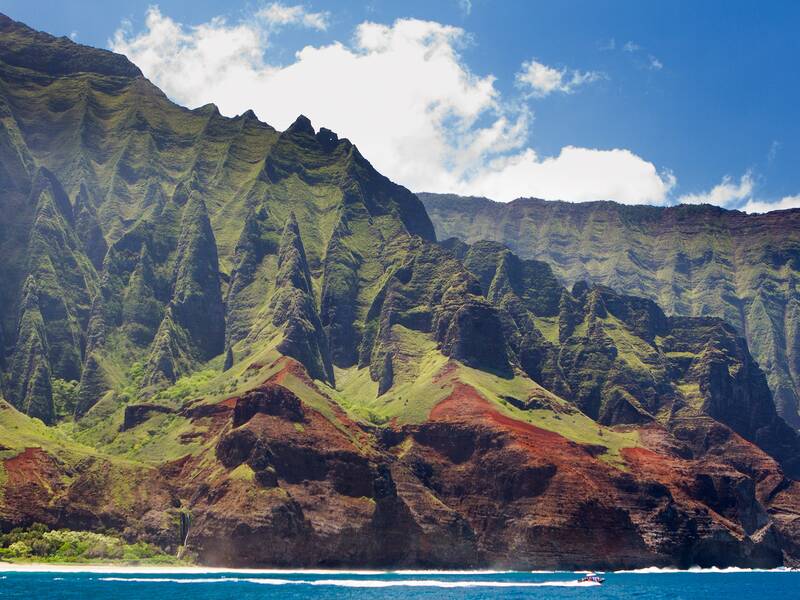 Kauai boasts one of the world's most insanely beautiful coastlines, which makes you work a bit to soak up its wonders—Na'Pali can only be seen from a helicopter, catamaran, or rather grueling hike. 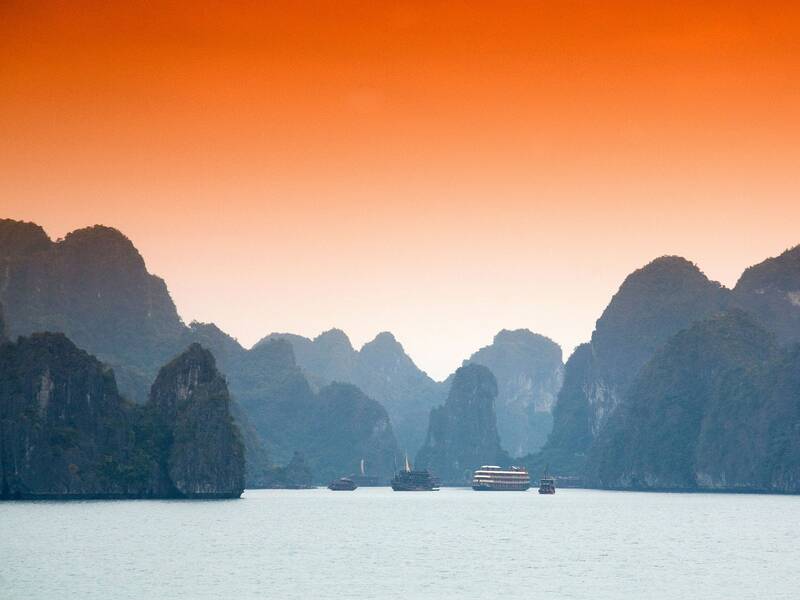 Halong Bay, located in northeast Vietnam, is beloved for its blue waters and spread of limestone islands, all occupied by tropical trees and wildlife. 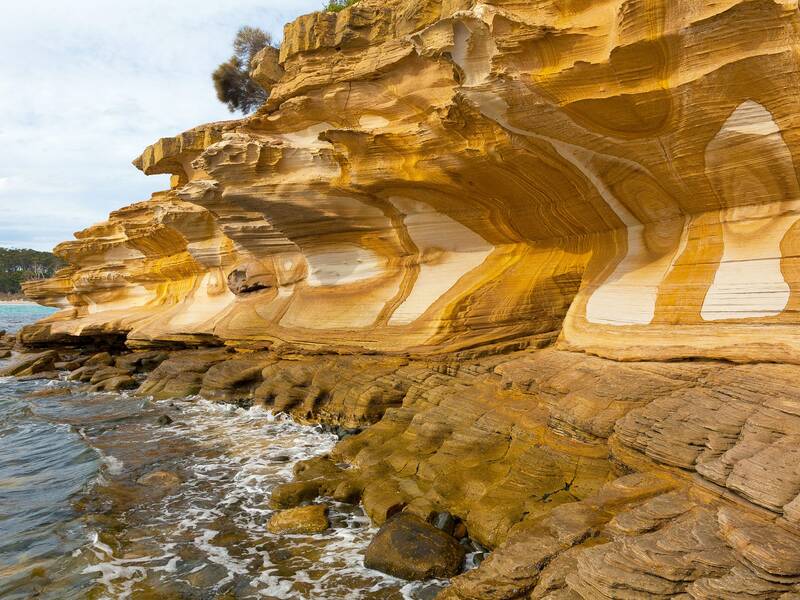 Tasmania's Maria Island is a motherlode of fascinating geology, including the swirling, Triassic-era limestone of the Painted Cliffs. 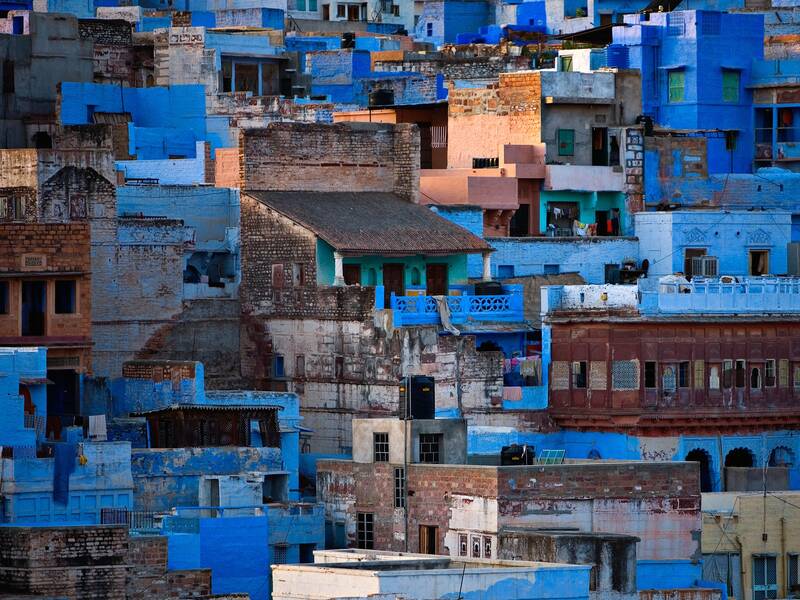 Jodhpur is an ancient city with plenty to offer modern travelers, like bustling bazaars, incense-scented air, and delightfully Smurf-like buildings as far as you can see.